ArizonaHikers - Community Based Hiking Discussion Board :: View topic - Sleeping pad for fibromyalgia sufferer? Sleeping pad for fibromyalgia sufferer? Posted: 3/28/2009, 6:32 am Post subject: Sleeping pad for fibromyalgia sufferer? I'm trying to help my husband find a suitable sleeping pad for backpacking. He suffers a lot from fibromyalgia pain, especially in the middle of his back, and some in his hips. He has bad insomnia, and really needs something very thick and comfy to lie on. It seems that Thermarest gets a lot of votes due to its durability. I also have found this to be true, but my little 3/4 thin one is not as cushy as he would need. I need to look at the wider, thicker ones, I guess. Any ideas as to where I should be looking? Oh, hey, I trust you! I myself have wanted to try a hammock! And up here in the mtns. there are plenty of trees, too! Now, to get my husband interested, that may take time! Liz, we use some pads that might work. Mid-month, this month, we spent a week backpacking the Mohave deserts using these pads and have used them since late last fall. You can see the stats on them at Moontrail�s Exped Synmat 9 DLX. Not a bad place to buy either. I got my Hilleberg tent from them. The Synmat 9 DLX is not ultralight but it is ultra comfortable, 76�x26� and 3.5� thick with very good insulation. I have never missed a �real� bed when using this pad. You blow it up with the built in foam pump, very easy when you get the rhythm. We packed these along for the entire week in the Mohave and sleep was sublime in our stealthily hidden backcountry mansion. You don�t want to every come back. Another thing to get is the the Thermarest Lumbar Pillow. Put that under your waist, let the air out until it conforms and just sleep on it. It works wonders for side sleepers. Also, use a good pillow. I make one out of my WM Flight down jacket and just stuff that in a Thermarest pillow cover. Don�t worry about carrying all the stuff. I have Girlfriend carry the tent, both pads, all the food, cooking gear and most of the water. 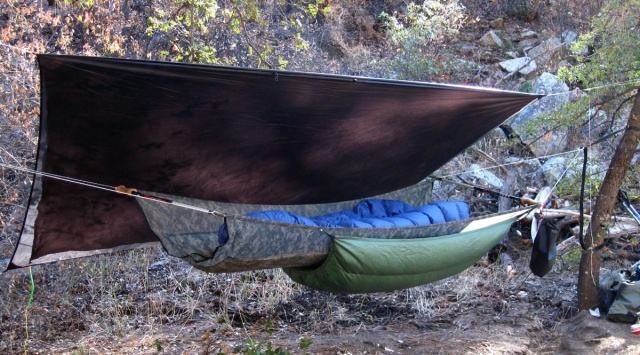 That way I can be ultralight but have a very comfy camp as well. She does just fine out there traveling across the vast expanses and that leave me freer to photograph her which is how I rationalize it. Thanks very much, I will look into this later today. I printed it all out to show him (he doesn't look at computers very often). I am hoping we can do a few one or two-nighters in the White Mtns. this summer, and then do Indian Garden or something very easy in the GC in the fall. Thanks, Sirena, sounds like it's the same one or similar (same brand) that BoyNHisDog recommends. We will definitely look into it! Same brand, hers has down for the insulation and mine is synthetic for the insulation. Both will handle cold but the down will handle even more. I forget the ratings but they are far more than I will ever need. I think I have more pads than any other kind of gear, started out fine with none as a teenager, upped the comfort over the years though. The thick, insulated Exped mats are sinfully comfortable. They come in several sizes with various weights. I found these at the Summit Hut last Fall. They got them out of the bags, showed how to inflate them and let us both try them out, the usual white glove treatment from those fine folks. They had both the Exped downmats and the synmats in the various sizes. Deciding to get a pair of them was very easy after that. They have performed for months now through fall, winter and the first bit of spring in various temperatures and terrains. I love these pictures and you are hysterical....you have a cabana girl, don't you?! Cabana girl along is a good thing. However, I may have been slightly exaggerating Suz. She does her part though and she does get to be the girl who has all the fun in the photography, starring in many photos during that week. On the other hand, I only got to star in one image. I set it up and had her trip the shutter.